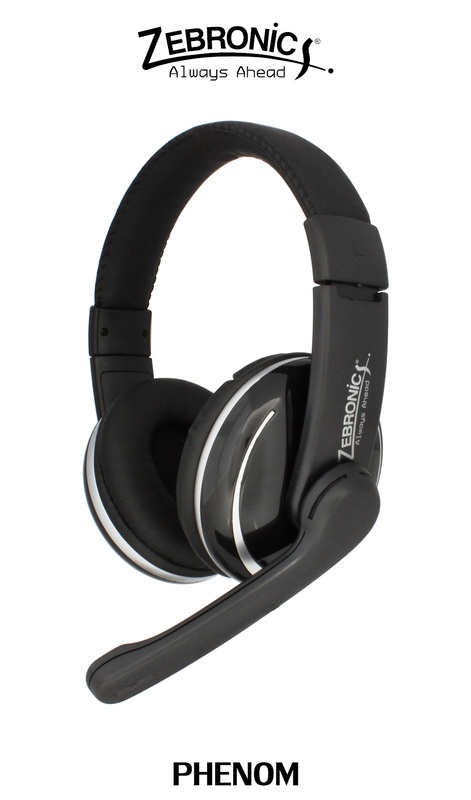 Top Notch Infotronix, India’s leading supplier of products and accessories for Computers, Consumer Electronics and Communication under the brand ‘ZEBRONICS', has introduced the Zebronics Phenom, a fantastic multimedia headphone with digital volume controller, mute button, mic on/off and inbuilt microphone. Designed to look and feel like the headsets worn by gaming enthusiasts, the Phenom is your battle-ready solution for powerful, immersive PC gaming audio. It delivers superior sound isolation, with full circumaural ear cups. The headset is built with foam ear cushions that mold to the shape of your ears for maximum comfort over extended use, making it the most vital weapon for your total PC gaming and music enjoyment. Whether blocking out the loud noise made by a bus driver, the construction work just outside the home or any other ambient sounds, gamers/users will hear nothing but the sweet, immersive sounds of music, destruction and victory. Phenom headphones give good all-round performance to be used for listening to music and watching movies as well as playing games. Zebronics offers its customers a distinctive sound experience with the new headphone. The 1.8 meter long cable has an attached multifunction remote control for even more relaxed use. The Phenom features padded soft contact surfaces, digital volume controller and movable Mic for optimum usage comfort. With a frequency response range of 20 HZ – 20000 HZ covering the full aural spectrum, it has been designed to provide excellent audio quality while playing games, listening to music and making calls. Intended to appeal to style-conscious users and match individual usages, the Zebronics Phenom has a Mic on/off and mute button to ensure that you have full control over the task you think of doing. It is available in Classic Black colour that would suit the personality of any kind of user, be they general users, professionals, gaming enthusiasts, female users, chatting friends and rock music. The Zebronics Phenom is available in the market for Rs 749/- and would be available across all leading retail stores across the country. The products are backed by 1 year warranty country wide. About Top Notch Infotronix (I) Pvt. Ltd. - Established in 1997 and headquartered at Chennai, Top Notch has one of the industry’s widest lineups of products and accessories for Computers, Consumer Electronics and Communication. encompassing a range that includes computer peripherals, gaming devices and media players etc, under the brand name "ZEBRONICS". The products are PC cabinets/chassis, keyboards, mouse, PC power supplies, UPS, monitors, webcams, speaker systems, headphones, networking hubs, multimedia players (including HD media player) and portable media players. Top Notch has 25 Branch offices and 50 service centres covering all major cities. The Company employs over 500 people and operates through a network of about 8000 channel partners throughout the country. With the widest range of stylish PC cabinets, power supplies, graphics cards and a vast lineup of headphones, audio accessories, portable media players, web cameras, TV tuners, input devices, speaker systems and many more, Zebronics stands for premium quality at value price points.